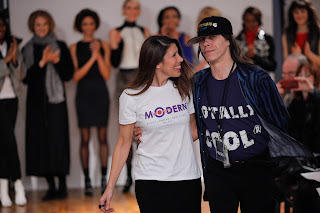 When a groovy evite (very Union Jack in its look and feel) hit this editor’s email, right before Fashion Week began, touting Stacy Lomman’s “Modern World” collection, the date went right into the “not to be missed” part of the agenda. Knowing Lomman and covering her first two clothing collections, it was significant in 2012 that her name and reputation appeared to be on the rise, especially since she had been nominated (and became one of the finalists for) the Women’s ready-to-Wear category in The Fashion Group International’s 15th Annual Rising Star Awards (unfortunately she was not one of the winners in the category), handed out in January 2012, at the star-studded Awards Ceremony, held at Cipriani 42nd Street. But, let me not digress. 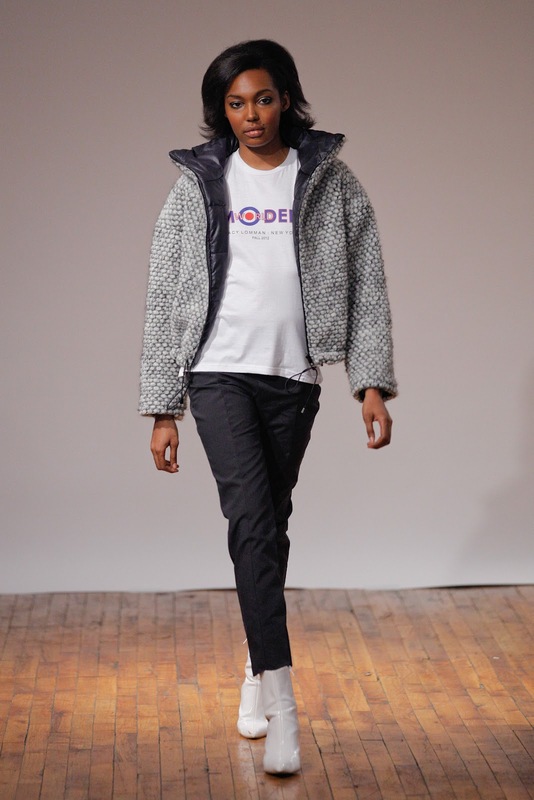 Always on the lookout for the next, big thing to rear up and rock-and-roll during Fashion Week, all editors (including yours truly) want to be on the fringe of the “new, now, next”. 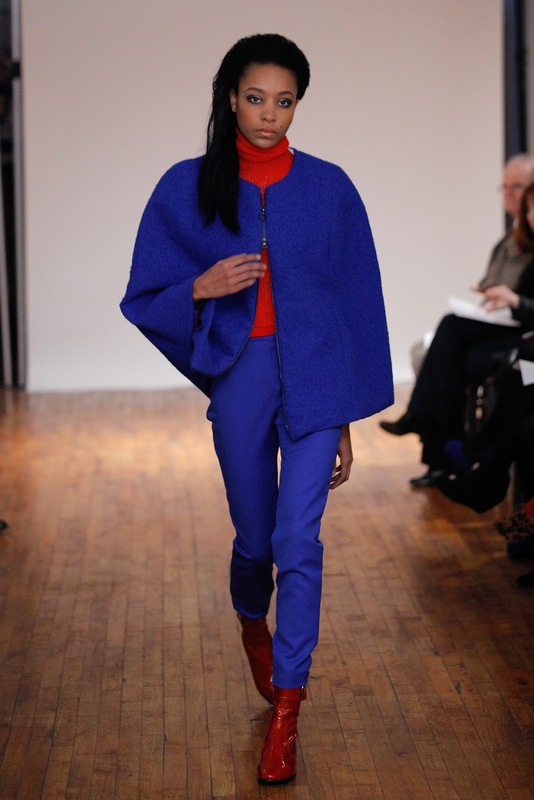 So, it was only natural and fitting to want to attend Lomman’s showing on the last day of Fashion Week (Thursday, 2/16/12) at Loft 33 in midtown Manhattan. Arriving a few minutes before show-time, and having to climb several flights of rickety stairs to the 4th floor (the elevator was out of order or something like that) where the show was being held, the promise of a fantabulous, l960’s Mod inspired collection seemed exciting and possibly different from everything else that had come before. In the end, the promise came across as partly right and partly wrong. For some reason, as with young designers who show in this way (Guerrilla style, mostly), there are reasons to preclude a timely beginning, but that, as we say in the industry, is kind of, sort of expected. And, why the crowd was thin (few editors in attendance, overall) is still a mystery, not only because Lomman is a new and different face in the crowd, but also because of that important nomination. Perhaps many of the invited guests simply did not do their homework on Lomman (who she is and what she does, and all of that), or perhaps they simply had something or someplace better to do or go. But, be that as it may, the show went on. Although some of the models here did not fit the theme of the collection as well as one might have liked, the hair (Cassi Hurd, You’nique Chic) and make-up (Rieko Shiba and Amy Park) were right on; same for Lomman’s music and styling, which made sense, since who could know the look, feel and ambience of the collection better than its young createur. Speaking of the clothing, most pieces on this runway nicely filled the bill and totally hit the mark. So, for the thirteen looks which comprised this collection, the majority were winners. 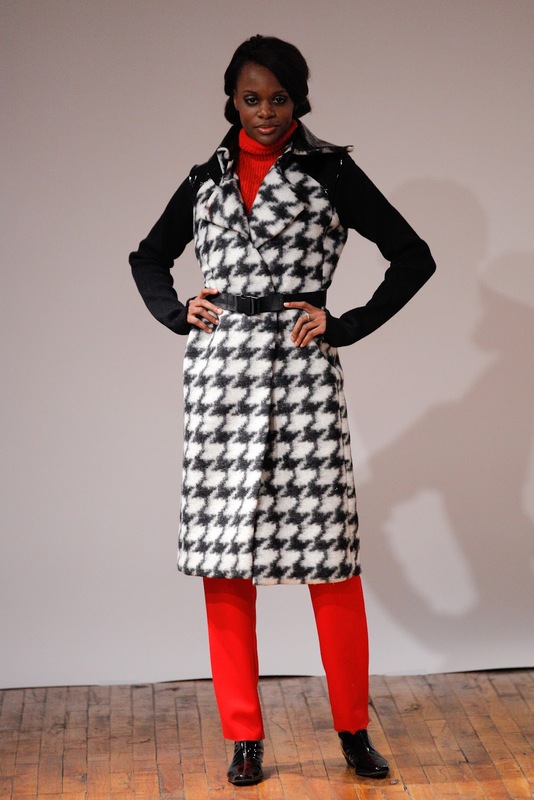 For example, the black double face long coat with knit sleeves, wool jumbo hounds-tooth shorts, hand-knit black and white baby alpaca scarf looked totally cool. The grey haze jacket with black trim and matching pencil skirt popped as if the ensemble came straight out of a l960’s glossy magazine editorial, featuring Jean Shrimpton, photographed by David Bailey. The royal gabardine racer back dress with red trim was super, paired with shocking lipstick red shorty boots. The faux ostrich, full-length sleeveless vest with black and white stripe charmeuse lining, worn with red double face wool mini dress with cut-outs seemed so perfect for a date with Austin Powers, while the finale piece; a black crepe back satin dress with ribbon Union Jack back detail brought back memories of lusting after every British rock and roll group every American girl loved and dreamed about lo those many years ago (this editor included). Rock and Roll, Brit Pop, The Spy Who Shagged Me, Call Them What You Want... ADWB Calls Stacy Lomman "Fantabulous!" It was a great show and the people who didn't make it will rue the day, when they're begging for future invitations! Very fair review. Thank you so much for the lovely write up and for attending!